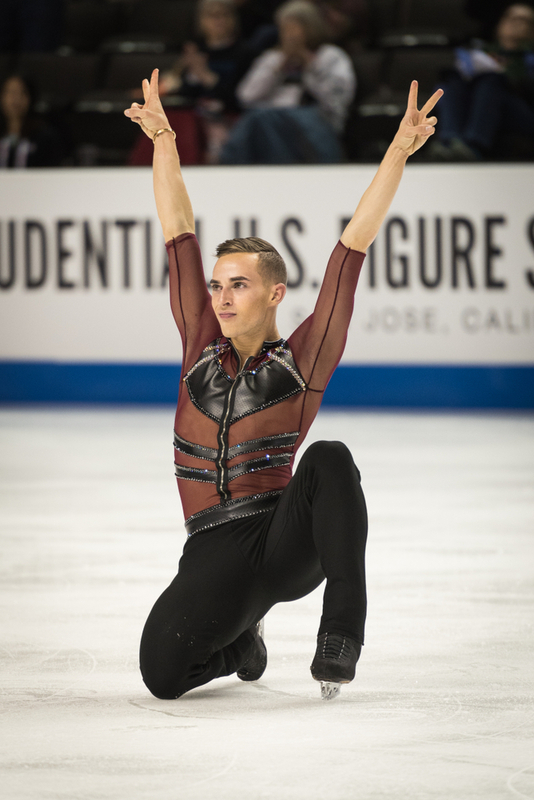 American figure skater Adam Rippon competing in the 2018 Winter Olympics. While the 2016 Summer Olympics in Rio blew away previous LGBT participation with 53 out athletes, Winter Olympics have always been less queer. This year, nine openly gay Olympians set a new record for the winter games, beating 2014’s four. Figure skater Adam Rippon has been making the most headlines so far. Rippon has already won a medal this year, taking bronze in team skating. Then there’s freestyle skier Gus Kenworthy. This is Kenworthy’s second Olympics. He came out between the two, in 2015. “I kind of feel like a whole new person because I’ve come out publicly and I feel really great just about that and myself and being able to be open about my sexuality and honest and authentic and all of those things,” Kenworthy said in a statement to USA Today. Speed skater Brittany Bowe has also been making headlines. While Bowe has not competed yet this year, she finished in the top five in every one of her races in the 2014 Winter Olympics in Sochi. Bowe is dating Manon Kamminga, another skater whom she met at the Sochi Olympics. Barbara Jezeršek, Australia, cross-country skiing. Swimmer-turned-skier, Jezeršek competed in the Olympics for her home country of Solvenia in 2010 and 2014. She immigrated to Australia in 2016. Daniela Iraschko-Stolz, Austria, ski jumper. Iraschko-Stolz took a silver in the 2014 Sochi games, and nearly missed this year due to injury and an emergency surgery. Eric Radford, Canadian figure skater. Radford became the first openly gay man to win Winter Gold at the Olympics this year, beating fellow LGBT competitor Adam Rippon. Belle Brockhoff, Australian, snowboard cross. Brockhoff is back for her second Olympics as well despite an injury while practicing in Spain. She hopes to take her first medal this year. Ireen Wüst, Netherlands, speed skater. Wüst has eight medals from two previous Winter Olympics Games and this year’s competition. With four gold medals, she is the most accomplished member of this list. There are almost certainly more LGBT competitors among the nearly 3,000 athletes. Hopefully, we approach a day when it will be safe for all of them to come out.